Many people have made a big deal about the Thesis Wordpress theme ever since it came out. While there is a lot of hype, many people aren’t thrilled about spending $87 for a personal license. At the same time, Thesis has some real advantages over many other premium themes. It really is the best theme out there. Many Wordpress themes claim to be customizable, but very few rival the power of Thesis. You can instantly change your blog from a two-column layout to a three-column one. Uploading a header is the same as uploading an image, so there is no confusing code to go through. Most of the layout options can be changed with just one click. Very little coding is needed for any layout changes. The layout changes are also clean. You don’t need to worry about certain elements being improperly moved or shifted. Everything looks perfect. What looks fine in Firefox may look terrible in Internet Explorer. Many people have experienced this problem, and it can really limit the number of people who use your website. Thesis doesn’t have that problem. The theme will look the same in every browser. There is no need to perform any compatibility tests, as there will be no differences. It’s funny. Most Wordpress blogs are used by Webmasters who want to hit the top of the search engines, but very few are ever built with SEO capabilities. Thesis has a built-in SEO program that does most of the optimization for you. You can also fill out the meta information, and there is a redirect tool if the page isn’t working. Thesis is also built on clean coding. Some Wordpress themes leave a huge footprint that affects loading speeds. A website that loads slowly is put at the bottom of the search engines, so Thesis will help your SEO. Do you have one post that really doesn’t benefit from the other ads you show on your blog? Thesis allows you to target ads to specific posts. This ensures that the ads shown on each post are relevant to the reader. You can also move the ads around, and you can make many other changes. No coding is needed to make these changes. 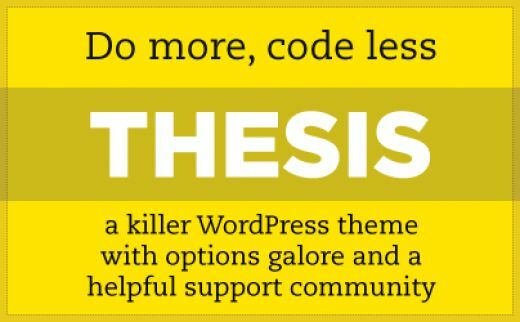 The Thesis theme takes the place of many Wordpress plugins. For example, its SEO function is almost the same as the All in One SEO plugin. This keeps you from having to find and download any of these plugins. While there is an obvious benefit to not having to search for plugins, there is another benefit that some people may not consider. Wordpress is constantly updating, but many plugins do not upgrade at the same speed. This means that the plugins may sometimes not work with the new Wordpress version. If this occurs, then the plugin will no longer work. Many people want to use different fonts in their posts, but most Webmasters are worried about the fonts not being browser compatible. Thesis is able to use Google Web Fonts. This gives you a long list of new fonts you can use without having to worry about certain users being unable to see the font. Thesis has a huge list of features. You can easily change the theme, use its SEO features, change fonts, target ads and use fewer plugins. It does more than any other Wordpress blog theme out there, so it definitely deserves that $87 price tag. If you need a theme that really works with you, then Thesis is that theme. Don’t forget you will also need high speed internet service for uploading and downloading content. AT&T has cheap internet offers which you can review by going to Att uverse coupon codes.